A staggering - 13 1/2" (34cm) long. Probably the largest Pop Pop Boat available. Comes boxed and complete with fuel holder, candles and priming dropper. The RMS Titanic is probably the largest tin pop pop boat available. This Titanic features a working steam engine. Light the candle to heat the real boiler to propel this huge tin toy ship through the water. 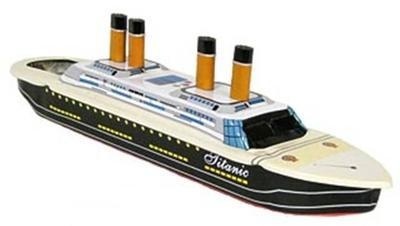 A reproduction of the Titanic and Steamship tin toys that were popular in the 1920’s and 1930’s. The Titanic was the largest steamship in the world when it hit an iceberg on its maiden voyage from Europe to America. A historic gift for a classic toy or tin toy collector!